THE Eastern Football League held its 2018 Annual General Meeting on Thursday night at Ringwood’s Karralyka Centre. 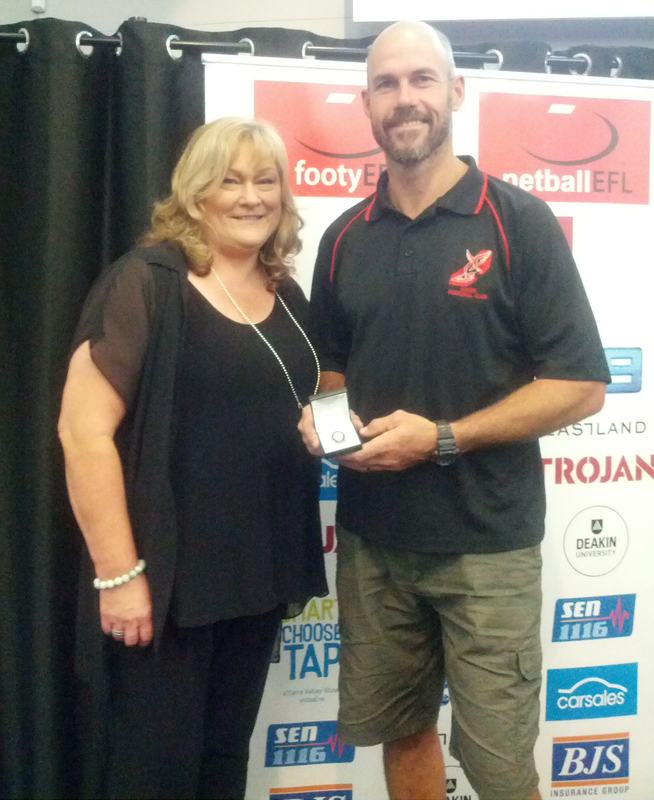 The evening saw three 300-game life members inducted, including Nick Goodwin, Paul Tredrea and Rodney Williams. 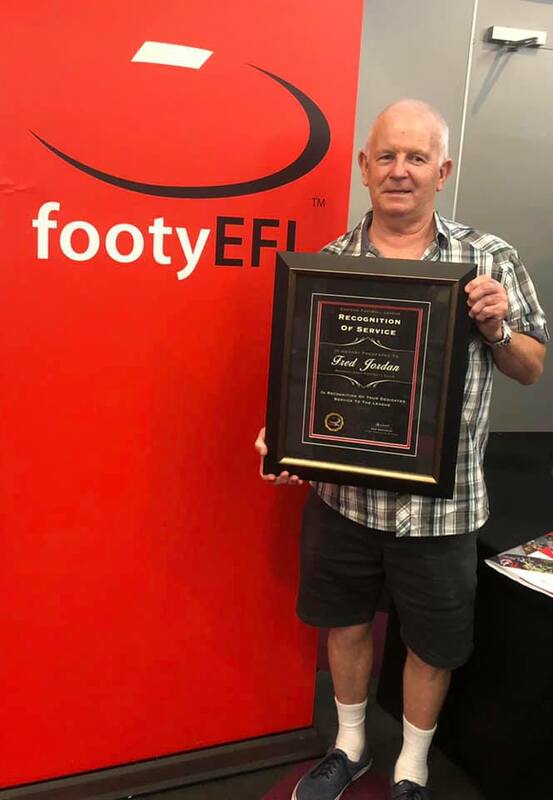 EFL Recognition of Service awards were also presented to Ian Barnes (Ringwood Football Club), Robyn Lawson (Upper Ferntree Gully Football Club) and Fred Jordan (Mooroolbark Football Club). Chairman Graham Halbish opened the evening with a review of season 2018, while Chief Executive Officer Troy Swainston addressed the attendees on the EFL’s 2019 plans and objectives. Commercial Manager Mark Freeman welcomed the EFL’s attending suppliers and sponsors for 2019 – Club Warehouse, Elastoplast, OnTrack, Project Clothing, TLA Clubhouse, Sportslines and Sherwood. The 2018 EFL Annual Report was also presented. See below for full 300-Game Life Member and Recognition of Service award profiles. Wandering into Schramms Reserve at 11 years of age in 1991, Nick Goodwin would begin a 27-year involvement at the Doncaster Sharks. A trip to the footy on a Saturday afternoon to watch his older brothers Anthony and Dean would quickly turn into goal umpiring and time-keeping duties, followed by taking the field – which more than two decades later, culminated in 300 games for the club in June, 2017. Goodwin began playing under-18s in 1995, where he would play until 1997. 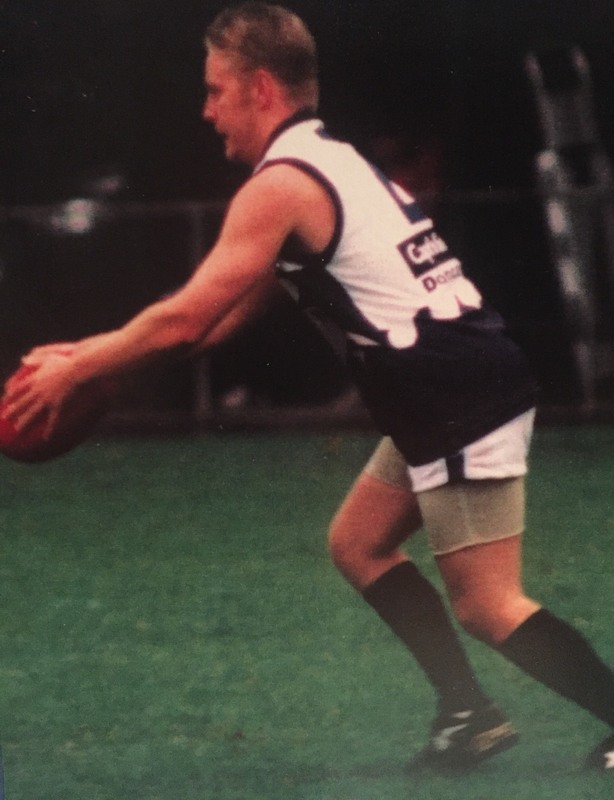 A premiership in 1996 as well as third-place in the best and fairest in 1997 saw Goodwin enjoy a successful run into the transition to senior football, debuting in the senior team in Round 1, 1998 against Mulgrave. The motivation for Goodwin has never been in individual awards, despite achieving numerous honours, including the reserves best and fairest in 2007 and 2013 – and runner-up on four occasions – third in 2000, and the reserves best first-year player in 1998 followed by the reserves’ most valuable player in 2010. Playing alongside his brothers, Anthony and Dean, in the seniors is a career highlight for Nick, who remembers the Goodwin-trio line-up fondly. 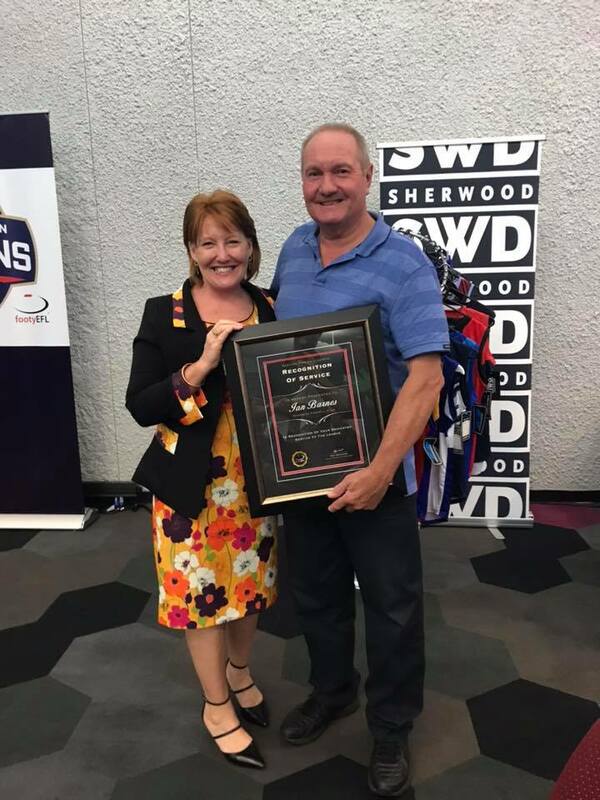 In 2012, Nick Goodwin was awarded life membership of the Doncaster Football Club for his tireless years of service on and off the field. 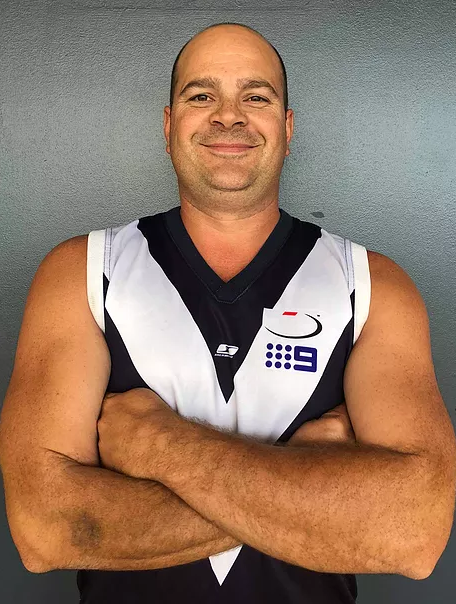 Over 30 years of service at the one club and a myriad of accolades later, Knox Falcons stalwart Paul Tredrea ran out for game 300 in April this season. Starting out at seven years of age in Knox’s under-8s in 1987, Tredrea would go on to forge one of the club’s most renowned careers, making the transition into senior footy in 1998. Tredrea was named on the wing in Knox’s team of the ‘90s and team of the quarter century, a club best and fairest in 2002 while also named in the team of the decade from 2000 to 2009 as vice-captain. It wouldn’t be long until Tredrea would taste the ultimate success with the Falcons in just his third year of senior footy, playing in Knox’s 2000 Division 3 premiership in a thrilling two-point win over Templestowe. For Tredrea, it would take something pretty special to top Knox breaking its nine-year flag drought in 2000, but the best was yet to come seven years later. In what is often regarded as the greatest grand final the Eastern Football League has produced, Knox battled South Croydon in the 2007 Division 2 decider which would end in a draw. In extra-time, the Falcons scraped over the line by six points in what Tredrea regards as his career highlight. Coldstream’s Rodney Williams achieved the 300-game milestone in May of this year. After playing the entirety of his juniors at the Coldstream Football Club, Williams made his debut in the senior side as a 15-year-old in Round 4, 1997 against Forest Hill. A shoulder reconstruction would hamper Williams’ 1999 season, before a remarkable comeback and break-out year in 2000 saw the versatile stalwart play all 20 games, culminating in the Division 4 senior grand final. The ultimate success would follow shortly after for Williams, playing an integral role in Coldstream’s drought-breaking 2001 senior premiership as the Cougars stormed their way through the home and away season to finish three games clear atop of the Division 4 ladder, accounting for Rowville by 123 points in the semi final and Ferntree Gully to the tune of 49 points in the grand final. Subsequently, a Division 3 senior grand final appearance in 2003 saw Williams and the Cougars fall agonisingly short of the club’s second flag in just three seasons. Williams would go on to play 43 matches for The Basin from 2007-2010, before later returning to Coldstream. Such is Williams’ reverence at the Cougars, he was named on the wing in Coldstream’s Team of the Decade (2000-2009) and was thereafter inducted as a life member of the Coldstream Football Club in 2016. Ringwood Football Club’s Ian Barnes began his playing career at the Redbacks in 1968, until a knee injury forced him into early retirement where he subsequently became a club a trainer in 1977 alongside his dad. During this time, ‘Barney’, as he is affectionately known, has served on the club’s committee, become a life member of the Ringwood Football Club and the Ringwood Spiders all-abilities team, and has had multiple awards named after him from both clubs, including the veterans’ best and fairest award. He has also been involved with the junior club as trainer for junior teams, including the under-9s this season while still trainer for the reserves, seniors and all-abilities. Barney can be found at the club almost every day, serving as handyman, cleaner and builder if need be, and the fall-back for anything that needs to be done. On a Friday before a game, Barney will be at the club vacuuming the rooms, cleaning the toilets, sweeping up and cleaning the outside of the rooms for anything that has been left and again after a game or function. He marks the ground for every game whether it be senior, junior or all-abilities, has painted sponsor signs, and is usually one of the last to leave at close to midnight after he has packed up everything and helped with the bar – all while working as a full-time firefighter coming to and from eight-hour night shifts. Due to his longevity of service, Barney is now training players whose parents he trained in previous eras, including current vice-captain Nathan Cairns’ father, Brett, when he was club captain, and started as a volunteer alongside Nathan’s grandfather, Jim. Mooroolbark Football Club’s Fred Jordan, who turned 71 in September, was born deaf and has a speech impairment, yet has contributed decades of hard-work at Heights Reserve. The passionate volunteer played over 130 games for his beloved Mustangs, but his greatest contribution has come off the field. Fred, more commonly known as ‘Freddie’, has contributed more than 2000 games of service to the club over 44 years. Club supporters say has no dramas in rolling up his sleeves and doing everything around the place and is a man that takes pride in the club and takes pride in its appearance. He does everything you could possibly imagine — the jobs that nobody wants to do. Freddie is the first to arrive at every home game at 7am, vacuuming the rooms, cleaning the windows and putting the padding on the goalposts. He goal-umpires for the under-19s and reserves, then heads on over to the scoreboard where he sits for the senior game whilst doing the scores. Such is the respect Freddie is held in, the club’s players chip in each year to cover his car registration. At training on Tuesday and Thursday nights, and during the pre-season, Freddie makes sure the water bottles are full, while also maintaining the footballs during the week, which has saved the club hundreds of dollars over the years. When Mooroolbark plays away, Freddie goes through the change rooms to collect any lost property, finding the odd gold coin, before returning all items to the club on Tuesday night. Those at the Mustangs say the club would not be where it is today without the kind and generous volunteer work that Freddie has contributed. Robyn Lawson has spent a lifetime involved with the Upper Ferntree Gully Football Club, starting with the St Johns Bluebirds Football Club when her sons began playing. She became secretary of St Johns Bluebirds in 1990, a position she held until 1994 before spending a year as secretary of the senior club in 1995. Robyn again became secretary of St Johns Bluebirds in 1997 and was also secretary of the Upper Gully Junior Football Club the following year after the merger with the senior club. When her son Matt moved to the senior club in 1999 to play in the Under 18’s, Robyn again found herself taking on the role of secretary from 2000 until 2004. With Robyn’s involvement in both the junior and senior clubs, she became the secretary of the Terry Hopkins Junior Development Foundation from its inception in 2001 up until 2013 when it was reorganised. Robyn also took on the senior’s secretary position again from 2009 until 2013. In 2017, Robyn took on the role of club chairperson and then this season became the club’s first female president – a position she will again hold in 2019. Robyn’s contribution over the past 30 years has also included at various times writing the club notes for the EFL record, along with organising and assisting with various functions, helping with after-game meals, providing support for pre-season camps, supporting the King Club Coterie Group, performing the role of club racial vilification officer as well as lending a general hand around the club whenever required. As well as Robyn’s significant off-field contribution to the club, she has watched a lot of football with sons, Matt, a life member of the club as well as the EFL, having played over 500 games including 316 senior/reserve games, Leigh, playing over 400 games with 235 in the seniors/reserves, and Jared, playing over 100 with the juniors and 109 with the seniors, while husband Wayne played one reserves game alongside years of coaching the juniors. Robyn received the club’s outstanding services medal in 2007 and subsequently became the first female life member of the Upper Ferntree Gully senior club in 2014, on her way to becoming the first female life member of both the senior and junior clubs since merging in 1999.